The truth is that marketing and marketing technology are changing. 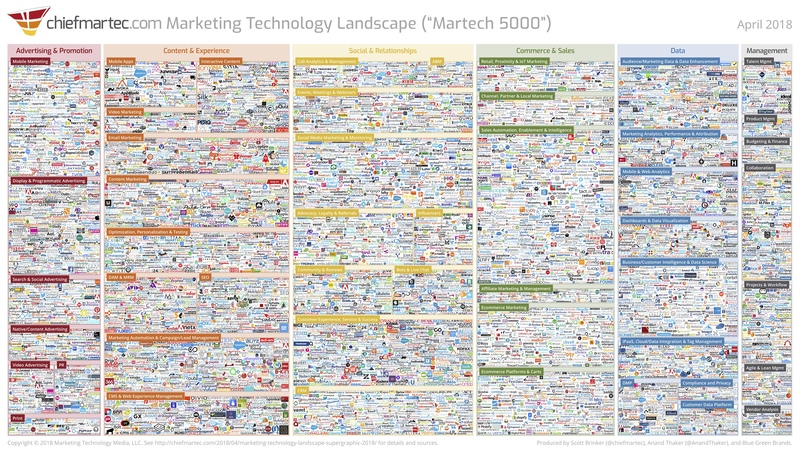 The challenges of trying to chart all these different martech apps — and running into philosophical debates about what qualifies as an “app” in a world of tens of thousands of pieces of software that could each claim to belong in that collection — is actually a pretty good reflection of the underlying evolution of software in general. While individual categories on the marketing technology landscape — and the larger vendors operating within each of them — continue to jockey between expansion and consolidation, all of this is happening against a backdrop of ever more apps, platforms, components, and services steadily expanding for the foreseeable future. Scott and team – you’ve outdone yourself. Again, and again, and again. Keep punching!! As always, this graphic is a great visual representation of the mounting challenges marketers face in choosing the right technology for their teams and businesses. To help ease that process, in an admittedly very small way, I was hoping you could recategorize Stackla’s visual content marketing platform as a content marketing solution instead of a social media marketing and listening platform in this landscape chart going forward. Since our core focus is on enabling brands to effectively discover, manage, publish and optimize their best earned and owned visuals, I think the content marketing category is more representative of the benefit we provide to marketers. Great work by y’all, and thanks for letting us use the base res file. Your work and insights are valuable and much appreciated!